I looked at traffic signs all week as I drove from home to work and back again. Our streets are very wide and I suddently realized that 95% of the traffic signs are along the sides of these 4-6 lane city streets and highways. I never remember seeing half of the signs that I saw when I was patiently looking (and trying not to hit the cars in front of me). 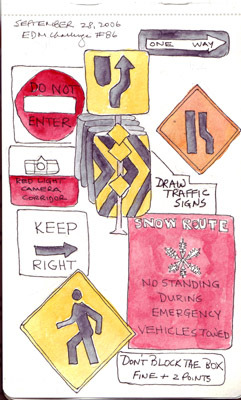 My favorite was the yellow and black sign in the middle of this drawing - on a signpost in front of yellow and black arrows. An undivided city street suddenly acquires a center median and all traffic needs to move to the right. If you fail to do so, you plow into the sign and a huge row of black rubber containers! My second favorite is the "Don't block the Box - Fine +2 points" sign. I wonder if our EDM members would have any clue what this sign means? 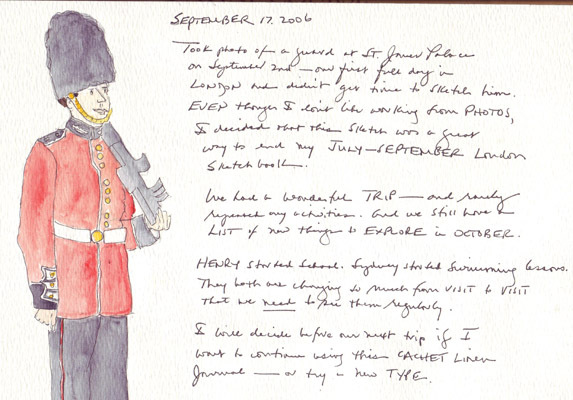 These are the last London sketches that I wanted to post from our September trip. All of the other pages of my sketchbook that I haven't scanned have drawings from our daily life with our grandchildren in my daughter's house. 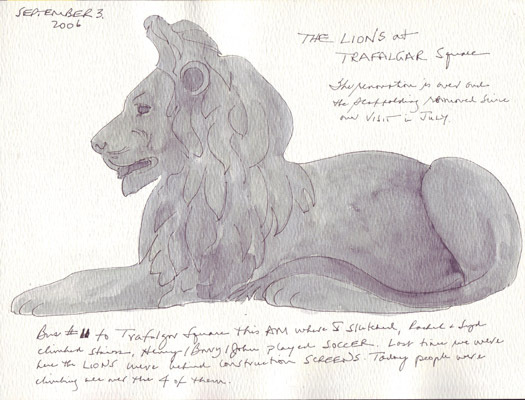 Lion: One of the recently refurbished and now uncovered lions from the center of Trafalgar square. The tourists are still climbing all over them for photos. 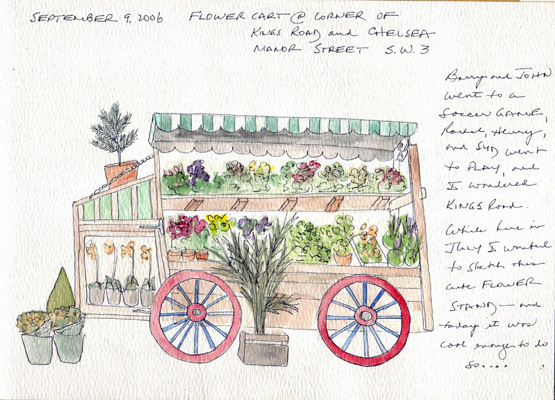 Flower Cart: A charming cart that is permanently set up along King's Road, Chelsea. The red and blue wheels, which add charm, are just propped up against the actual cart. While I was sitting on a small step at the corner, the only person who stopped to talk was an 8-10 year old boy who then had to catch up with his mother and brother. He spent more time with me again on his return trip down the sidewalk - but Mom didn't seem really interested in letting him take time to ask all of his questions. London Taxi: I Love all of the gaily-colored London taxis, many with very interesting exteriors that are part of a total car advertisement. 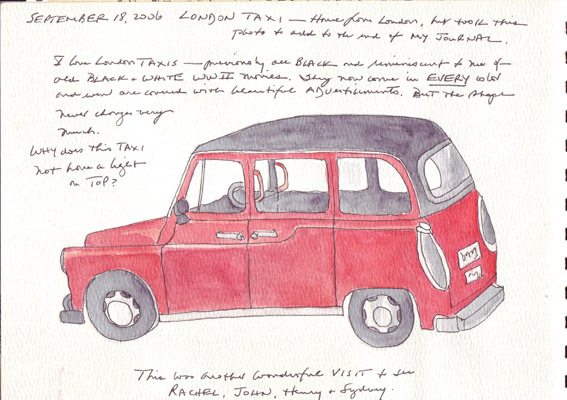 This sketch was done from a photo while the taxi stopped for an instant to let off passengers. It was only when I was drawing it that I noticed there was no light on top. St. James Palace Guard: We were walking by the Palace with my 3 year old grandson Henry when the guards changed shift. I took a photo of the new guard when he got into position and then did this drawing from the photo. Fish: When we visited London in July, Osborne and Little Decorating Shop on King's Road had ice cream cones in their windows. This time it was fish. Each of the colored pieces in these drawings are separate fabric-wrapped pieces of cardboard or wood. 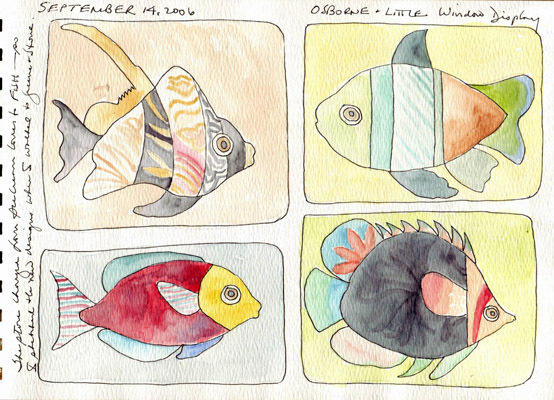 There were 4 types of fish as pictured here and each window had multiple fish of a single design. I can't wait to see what their Holiday display is going to be. I went into the store to ask permission to take a photo when I was done sketching and learned when the windows will change again. 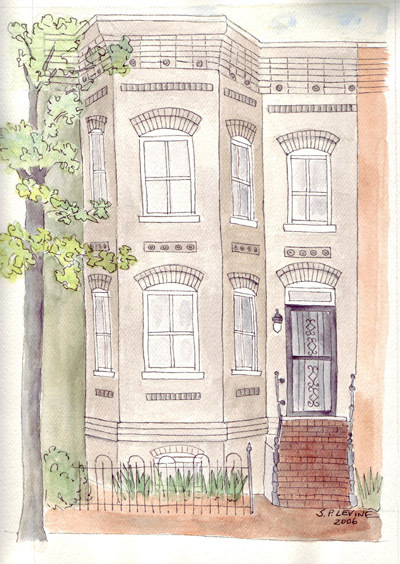 In May I did a quick sketch of my son and daughter-in-law's new house - an East Capital Hill row house. They liked the sketch enough that I decided to paint it again on larger paper - and will deliver this sketch (done on 9 x 12") paper to them this week. It was done with lots of love and best wishes for many, many happy years together in their great house. My husband and I enjoyed more and different museums on this second visit of 2006. British Library: I wanted to read an 1857 copy of a 1764 manuscript that described a prisoner exchange with the Ohio territory Indians during the French-Indian War. My ancestor was one of the kidnapped colonists who was returned to her family during this exchange. 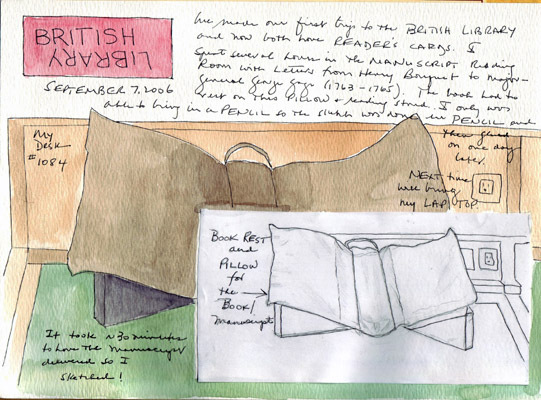 Only pencils are allowed in the Manuscript Reading Room, so while I was waiting to receive the manuscript, I sketched the book pillow on which all such "elderly" books must rest. We now have British Library reader cards! 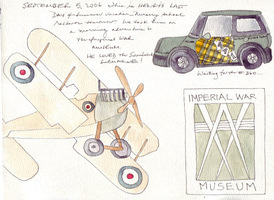 Imperial War Museum: Our last visit was in 1970! This time we took our 3 year old grandson who loved the interactive submarine. We will return soon to see the Children at War (WWII) exhibit that we couldn't see easily when he was with us. 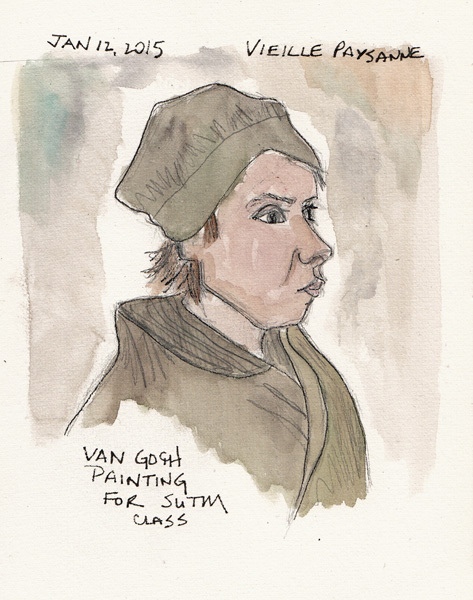 National Gallery: We visited parts of the National Gallery and National Portrait Gallery and I decided I would like to try a copy of a simple Van Gogh painting to commemorate the visit. 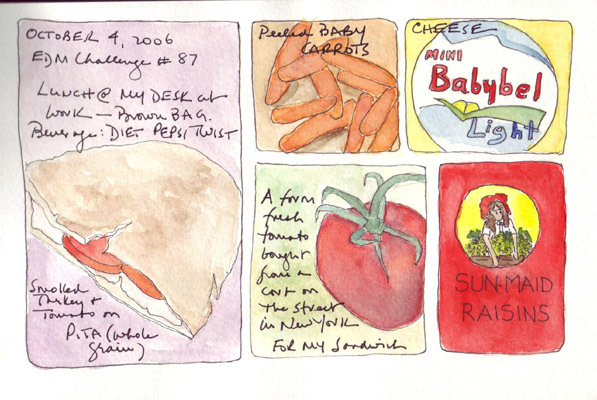 I bought a postcard of this painting from the exhibit and sketched/painted it later in the day. 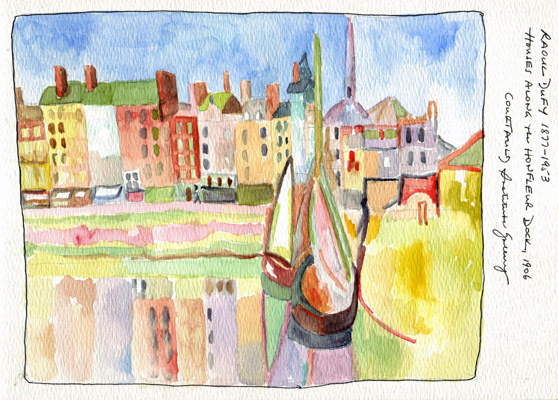 Somerset House-Courtauld Art Instutite: The Raoul Dufy painting seemed like an appropriate painting to copy since the EDM challenge was to draw water and because I wanted to see how well I could mix and match paint colors. 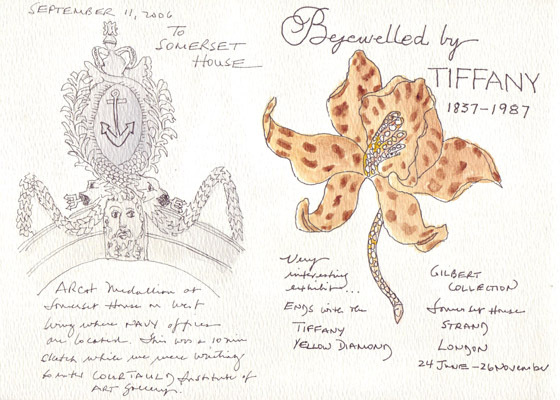 Somerset House-Gilbert Collection: A medallion from the outside of the building on the River Terrace and one of the most beautiful pieces of jewelry in the current Tiffany exhibit. I wasn't sure what the rules were about sketching the jewelry, so I sketched this image from the brochure while we had lunch in the River Terrace cafe.